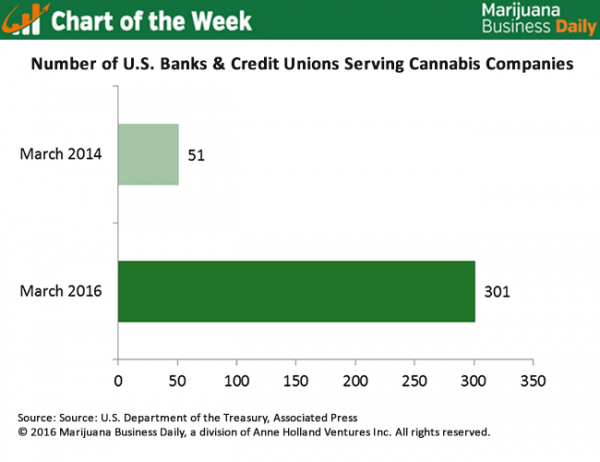 The number of banks and credit unions providing services to marijuana businesses has grown dramatically over the past 24 months, providing some much-needed relief to the cannabis industry. In March of this year, 301 financial institutions were working with marijuana companies, according to federal data obtained by the Associated Press. That’s up from just 51 in March 2014 and a three-fold increase from later that year, when an estimated 100 banks and credit unions worked with the industry. The increased access to banking services is no doubt an immensely positive development for the industry. But cannabis companies still face many challenges on this end. As of last December, for instance, 70% of marijuana business that touch the plant and 49% of ancillary MJ firms didn’t have bank accounts, according to a Marijuana Business Daily survey. Nevertheless, the latest figures show that a growing number of banks are becoming comfortable with the notion of providing services to marijuana businesses. Part of that is likely tied to guidance the U.S. Treasury Department’s Financial Crimes Enforcement Network issued in early 2014 that lays out steps financial institutions must follow to serve marijuana businesses in states that have legalized medical or recreational cannabis. That said, just about all of those banks that have marijuana related clients prefer to keep mum about their accounts, lest they invite unwanted scrutiny from federal regulators. Mum or not, it is in banks’ best interests to start serving the cannabis industry, said Patrick Moen, a former DEA agent and current general counsel at Privateer Holdings, a Seattle-based private equity firm that owns marijuana businesses. In fact, Moen said many financial institutions probably already are serving the industry in some way or another, whether they know it or not. What banks or credit unions in WA are openly serving 502 businesses? There are about great options in Washington for i502 banking. If you are looking I connect you with some options and you can decide from there! We specifically deal with a credit union and they have been key in our success. Please provide as i have a few clients with retail stores looking. Could you connect me with a bank in Washington that provides these services? You don’t mention the fees these banks & credit unions are charging for cannabis industry accounts. Until this changes, I think we’ll continue to use cash, with money orders when cash can’t be used. It is true that banks and credit unions that serve our industry are expensive. There are a couple of reasons for that. One reason is that it is more labor intensive to compliantly board and maintain cannabis business accounts. Another reason is much more obvious- supply and demand. This will eventually change as more financial institutions bank our industry. As a business owner, it is your choice on how you wish to deal with banking. Consider how much your and your employees’ time and safety is worth. It is both time consuming and risky to run around to buy money orders to pay your venders. It is also time consuming and stressful to have a bank account shut down with no notice. I personally know of one company that had 3 different bank accounts shut down due to subterfuge. Last year at this time, there were 200 financial institutions that knowingly banked cannabis businesses. It is great to read that that number is now over 300. People say testing is “expensive” though its less than 5% of the cost for larger operations. I’m more concerned with 280E then a grand or two a year in fees…. 4-10x mark ups by dispensaries is cool though? Mark – Do you have time to connect? What services do you provide? Did you ever get a list of banks? Can anyone point me in the direction of banks in California that do cannabis business accounts ? I’ve done some research, but most here don’t seem reputable. Thanks in advance. I noticed that there aren’t any reply about which banks in California serve our industry. Has there been any headway?